A Spiegeltent full of great wine, unique cuisine and jaw-dropping circus. 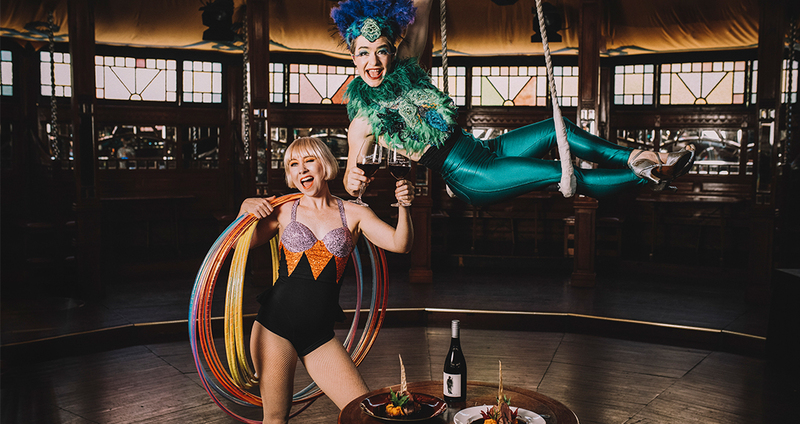 We’re going to wine you, Charcoal Lane will dine you and Circus Oz will wow you with an array of stunning performances in their historic Melba Spiegeltent for the Melbourne Food and Wine Festival. Now that’s what we call dinner and a show. If you’re not a Melbourne-local (or you’re non-existent on social media) and you haven’t heard of Charcoal Lane, they’re a Mission Australia social enterprise restaurant who were recently splashed across the headlines for being visited by royalty. They’ve expertly designed a unique menu for the event, taking inspiration from native Australian cuisine. Then we’ve got long-time friends Circus Oz, Australia’s premier contemporary circus boasting an all human ensemble. They’ve rounded up a team of extraordinary performers who will surprise and delight you with breathtaking stunts and irreverent humour. Tickets include: Canapés and a drink on arrival, plus three courses of cutting edge cuisine matched with IB wines and breathtaking performances.